The comments came after worldwide audiences witnessed the first "event horizon" of M87, a black hole at the center of the Virgo A Galaxy, in simultaneous press conferences in global cities last week. Sixteen Chinese scientists participated in the creation of the photo, working in areas such as computer modeling and data analysis. But some argue that China's role can be bigger. Space experts and commentators said China's capacity in exploring the cosmos still lags behind developed countries such as the US, Japan and members of the EU. Cosmological exploration is a multifaceted effort, ranging from observing the universe from the Earth or its orbits to sending spacecraft to the stars. Theoretical study and analysis are equally important. 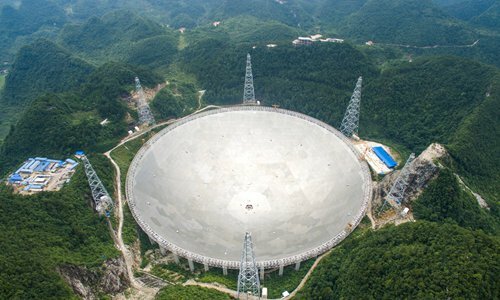 Yuan Qiang, a researcher with the Purple Mountain Observatory, one of the most important observation centers in the country, said China is a latecomer in the field of cosmological exploration. For instance, China's Wukong dark matter detection satellite, which was launched in December 2015, has Western counterparts that date back to the 1970s, although these are based on older technologies, Yuan said. "Gaps also remain in industrial capacity, with the Chinese industrial system's lack of capacity to churn out high-grade, precision and advanced industrial products needed for astronomical endeavors," Yuan told the Global Times on Monday. "At times, we couldn't make the necessary hardware because we had zero experience in a given project or subject," Yuan said. Besides observation, space discovery means actually going into space. Yang Yuguang, a research fellow with the China Aerospace Science and Industry Corp, told the Global Times on Monday that China's space industry leads the world in terms of scale, but lags in terms of sophistication by a wide gap. "The US, for instance, landed men on the moon 50 years ago. China aims to achieve that by 2030," Yang said. Moreover, the US is the only country so far to safely land a rover on Mars and the only country to have explored celestial bodies further away than the planet Jupiter, Yang said. However, Yang said China will build itself into a strong space power by the middle of this century. In recent years, China has launched the Tiangong-2 space lab, quantum science satellite Mozi and carrier rocket Long March-6, which carried 20 micro-satellites for space testing. In January, China's lunar lander Chang'e-4 and lunar rover Yutu II explored the dark side of the moon. China's 500-meter Aperture Spherical Radio Telescope, nicknamed Tianyan, made its first discovery of two pulsars in August 2017. Scientific development leadership also appears to be uneven, with Chinese projects already achieving best-in-class results in some aspects of celestial discovery, according to Yuan. "For instance, the BGO (Bismuth Germanate Oxide) calorimeter on the Wukong Dark Matter Particle Explorer far exceeds any other satellite-based detectors in terms of accuracy today," Yuan said. Due to China's later-starter status, Chinese scientists' access to global science projects such as the Atacama Large Millimeter/submillimeter Array in Chile is limited. But China has been catching up. In March, China signed into the Square Kilometre Array (SKA) international science project as a founding member along with Australia, Italy, the Netherlands, Portugal, South Africa and the UK. SKA is the first global project in which China got involved and has been playing an important role from scratch, according to a news statement on the website of the National Astronomical Observatories of the Chinese Academy of Sciences. SKA, a radio telescope project proposed to be built in Australia and South Africa, should be able to survey the sky exponentially faster than before. China, a rising power actively engaged in international endeavors, is being increasingly welcomed by initiators of next-generation global projects, said Yuan. "China's capacity to bring funding and talent, whose complementary work can be vital to lead researchers, is hard to overlook," Yuan said. China's financial input in research and development in fundamental science doubled from 41.2 billion yuan ($6.5 billion) in 2011 to 82.3 billion yuan in 2016, according to information released by the Ministry of Science and Technology in February 2018. In comparison, the US total basic research budget exceeded $38 billion in 2018.
International cooperation also provides opportunities for Chinese scientists and engineers to improve necessary hardware, Yuan said.